In this guide, we assume that you have gone through your initial server setup. You will also need to install a LAMP stack on your server. We will also assume that you have installed WordPress on Ubuntu 12.04. You can follow our guide on how to install WordPress on Ubuntu 12.04. If you do not have key-based updates and installations configured, you will get a prompt for connection information whenever you attempt to do either of these tasks. FTP is an inherently insecure protocol, so we do not recommend you using it in most cases. We will be configuring our installation to use a secure alternative. If you followed the guide on installing WordPress above, you will notice that you gave permission of the web directory to the Apache web user. This is a very quick way to get started, but can potentially be a security risk. 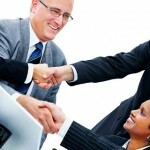 In an ideal situation, you would separate the content owner from the web process. We will do this as part of our preparation for allowing SSH updates. We will create a user called wp-user to own our WordPress installation. You will be asked a lot of question, including the password you want to set. We do not want to set a password, so press “ENTER” through all of the prompts, including the repeated password questions. Next, change to the /var/www directory, where our WordPress files are being served. We will give our new user ownership over everything under this directory, changing it from thewww-data Apache web user that we configured during installation. You will be asked where to store your keys and what to call them. Choose /home/wp-user/wp_rsa. You will also be asked to choose a passphrase. Press “ENTER” through the prompt to create a key without password authentication. You need to create the~/.sshdirectory and give it appropriate permissions and ownership so that the web process can log in. Now, we can input the public key into our authorized keys file so that the user can log in using those credentials. Since we do not have this file already, we can simply copy the public key. Now that we have the utilities, we can edit the configuration file and set the values that we configured. 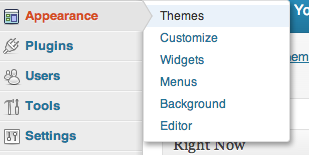 We can check that our settings are configured correctly by attempting to install a new theme. Click on “Appearance” and then “Themes”. You can click on “Activate” to switch to the new theme and then click “visit site” to see the results. There are some issues that you may run into if you’ve configured your SSH keys incorrectly. Improper permissions on the public key, private key, and the directories that contain them. The web process needs to be able to read each of these files, so if the web-server group is the owner, then each file needs to have at least 640 permissions. On the other hand, the~.sshdirectory only needs to be accessible to the user that will be logging in. This means thewp-useruser in our example. The contents of the directory should be similarly owned by this user and not writable by anyone else. Improper file ownership. These same keys need to be owned by the correct parties. Between owner and group-owner, this is often a mixture of the user being logged in and the web process user. In our example, thewp-userowns both the private and public keys, while the www-data group is the group-owner. This allows us to associate them with the correct user while allowing the server to read the files. Improper file formatting. 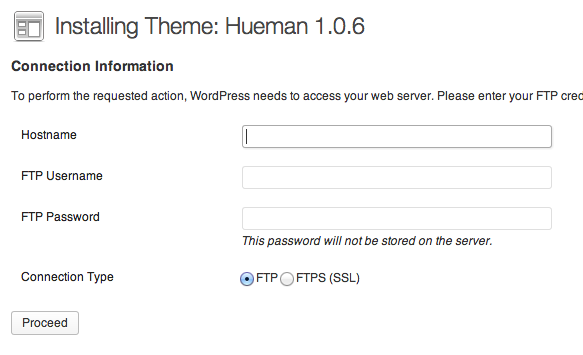 If your public or private key has formatting issues, WordPress will reject the key and refuse to use it. The same goes for the~/.ssh/authorized_keysfile. The portion that you added to the authorized_keys file,from="127.0.0.1" ...should not exist in the public key. Even though SSH will consider it a valid file, WordPress will reject it as invalid before even sending the attempt to the SSH daemon. This is usually an issue with incorrect web-directory ownership. If you are going to be updating the files with thewp-useraccount, the upload directories also need to be owned and accessible by this user. This means that you need to give the files and folders within the/var/wwwdirectory to thewp-useraccount. If you followed the instructions above and are still having problems, make sure you passed the-Roption to thechowncommand. As you can see, the file permissions that read-rw-r--r--and the directory permissions that readdrwxr-xr-xindicate that thewp-user, who owns the files and directories, has write permissions and others do not. A similar check within thewp-contentdirectory, which contains themes, plugins, etc, will show us whether these directories are owned by and writeable by thewp-useruser. These directories are correctly configured. While WordPress is convenient and can be configured and managed relatively easily, it does not mean that security should not be a primary concern for your site. Something as simple as updating your installation, which should be done immediately upon any security release, should be simple. It also should not be a procedure that forces you to use insecure protocols or set insecure directory permissions. Securing your update procedure and correct directory permissions is one easy task that can prevent a rather large security concern.